In an independent laboratory study, IMPULSE™ was 143% more effective than the leading soft plastic brands...period. Fortified with Northland’s top secret attractant, IMPULSE™ stirs up powerful cravings in fish—they eat ‘em and hold onto ‘em. Never before has a soft plastic bait combined all three fundamental fish-attracting features—Scent, Color and Action – into one supremely appetizing presentation. Micro plastics are the hottest baits on the ice fishing scene, but only IMPULSE™ perfectly blends natural shape, color, action and scent. Fish see ‘em, sniff ‘em, bite ‘em and hold ‘em! With four natural micro invertebrate body shapes, matching the underwater hatch is as easy as opening a pack. 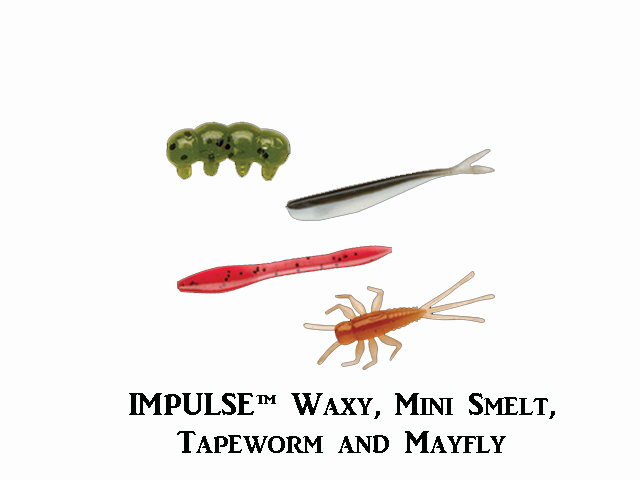 Check out the silky swimming IMPULSE™ MINI SMELT, mud-diggin’ IMPULSE™ MAYFLY, larva-like IMPULSE™ WAXY and the ultrathin, gummy IMPULSE™ TAPEWORM. In sealable bags, IMPULSE™ REACTIONARY BAITS excite the bite and seal the deal! For more information and a 2011 catalog, contact Northland Fishing Tackle® Inc., 1001 Naylor Drive SE, Bemidji, MN 56601. Phone is (218) 751-6723 or email us at norfish@northlandtackle.com. Website is http://www.northlandtackle.com/. Northland Fishing Tackle is a sponsor of the Fishing and Outdoor Radio Show.